A single gene may produce multiple end products or proteins. The process, responsible for creating multiple proteins, is known as Alternative Splicing. If you imagine the structure of a gene as the organization of two types of boxes (exon and intron) arranges alternatively, the single gene product depicts the scenario of taking out "intron boxes" and put "exon boxes" in order. What if when one "exon box" is missed or one "intron box" remained? That doesn't sound like expected output. It suggests the ability of the system to splice out boxes in an alternative manner. 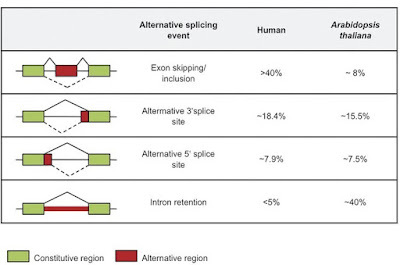 Alternative splicing event usually occurs in 4 ways: exon skipping/inclusion, alternative 3' splice region, alternative 5' splice region and intron retention. Alternative splicing is a common event in every living system. It provides an amazing opportunity to uncover which type of alternative splicing is common in an organism. There is an excellent article in The Plant Cell shaded light on the alternative splicing events of Human and Arabidopsis thaliana at the same time. I love the following figure of that article so much and probably you'll also find the reason with a glance. Exon skipping or inclusion is the most common type in Human (>40%), in contrast, intron retention is the frequent event in Arabidopsis (~40%). 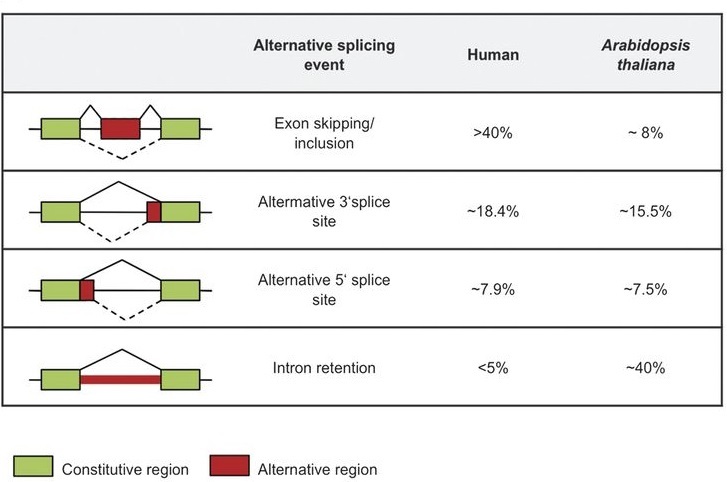 Clearly, preference of alternative splicing events varies among organisms. This is one of the powerful examples, I believe. 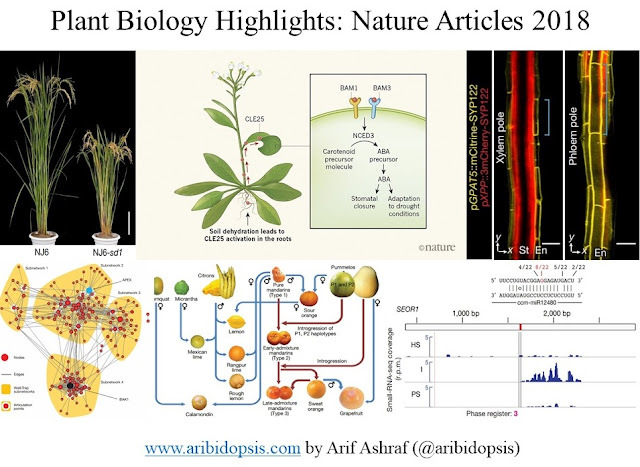 In recent years, plant biologists emphasis more on solving abiotic stress-related issues. We are living in a time when global warming is no more the scientific facts or figures, it's what we are experiencing. Like us, plants experience the fluctuation of temperature. Plants don't have the home to go and warm it up or cool it down. It stays at the place where it starts the life. As a result, temperature challenge is one of the major obstacles for plants. Furthermore, low-temperature induces the formation of ice crystal and consequently causes osmotic stress. High temperature is responsible for drought stress. Temperature stress certainly imposes multiple or combination of stress for plants. Overall, more labs are interested to work on temperature stress and plant adaptation than ever in recent years. Altogether, temperature stress research has become more interesting than ever and tempting! The study of stress response in the global genome-scale had a boom in the last two decades. From the microarray to till today's advance sequencing technique, relentless efforts have been made to compare the transcripts and proteins under various stress condition to find out the differentially expressed genes. Such an amazing system to figure out target genes. It gives a very good starting point to figure out the genetic circuit connected to developmental cues. Unfortunately, a number of publications and generated data remained unexplored for finding the downstream regulation. Because a good number of publications focus on the comparative study and present the number of up- and down-regulated genes. 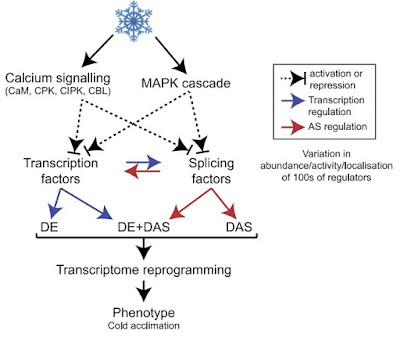 In a recent Plant Cell paper, they explored the genome-wide transcript change at low-temperature stress. Their approach was focused to find out the alternatively spliced genes and splicing factors at low-temperature. This dataset reflects a more dynamic cold stress response. They have identified a group of alternatively spliced genes and interestingly 4 of them (RCF1, STA1, GEMIN2, and LAMMER) were reported to be involved in freezing tolerance and acclimation. Additionally, they have validated the cold response of one of the unidentified genes (U2B’-LIKE) from this set. This work is really interesting because when we can identify the alternatively spliced genes or splicing factors, it suggests that this dynamic process or alternative splicing is low-temperature specific events. At this point, I will take the discussion to the next level. After getting the target, such as splicing factor, at the low-temperature, we may think about to mutate or overexpress it to get the cold resistance or sensitivity. But, the fundamental events like intron splicing requires careful thought. Modifying one of the splicing factors will affect the regular intron splicing events and even without low-temperature treatment, it will work to affect other genes important for plant growth and development. Based on this problem, it's a smart approach to find out a temperature-specific mutant which will only show the phenotype under restrictive temperature (high or low) but remains the same at the permissive temperature. In a recent Nature plants paper, they performed strand-specific RNA sequencing of wild-type seedlings at 16°C, 23°C, and 27°C. From this dataset, they have focused to find out temperature-specific splicing factor using corresponding knockout mutants. They have found one candidate gene, a small nuclear robinucleoprotein family protein which contains a Like-Sm (LSM) domain. They named it as PORCUPINE (PCP) due to its “spiky” phenotype. 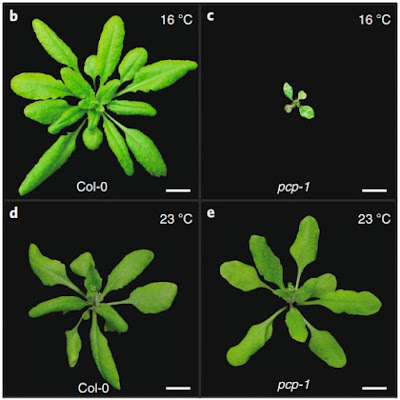 As a temperature-specific mutant, pcp-1 shows dramatic developmental defects only at 16°C. Additionally, they have found that WUSCHEL (WUS) expression was increased and CLAVAT3 (CLV3) expression was decreased at the same time in pcp-1 at 16°C. One may predict that as a splicing factor, PCP may alternatively splice developmentally important genes WUS and CLV3. In fact, it was not the reason and it was predicted that PCP regulates shoot apical meristem development through WUS and CLV3 in an unknown pathway. 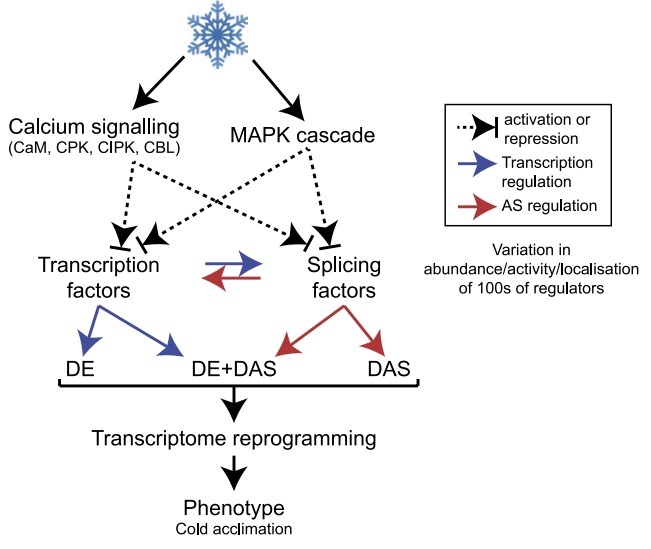 Although this article left us without mechanistic explanation, it has provided an amazing ground for future research to explore how a temperature-specific splicing factor regulating the array of genes important for plant development.